A co-ordinated approach by public sector bodies including the police and fire and rescue services is key to bringing a water safety campaign to a wider audience this winter. The Don’t Drink and Drown campaign, run by Royal Life Saving Society UK, is launching on Monday (4 December) with a week-long drive to share the message that alcohol and water can be a fatal combination. The Maritime & Coastguard Agency (MCGA) – an executive agency of government sponsored by the Department for Transport – is among public sector bodies to support the campaign. Jo Groenenberg, marketing officer leading on the campaign for the MCGA, said the agency is finalising its planning for sharing the campaign. Meanwhile, police forces, fire and rescue and ambulance services are among organisations nationwide spreading the messaging ahead of the official launch next week. 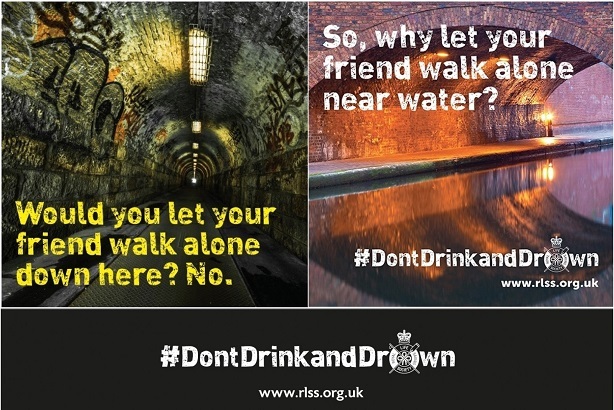 Using the hashtag #Dontdrinkanddrown on social media including Twitter and Facebook, the aim is to spread the hard-hitting campaign message that going in, or near, water after drinking can have tragic consequences. Statistics show that more than a fifth of drownings involve alcohol or drugs, with 177 fatalities recorded between 2012 and 2016 attributed to people walking home after drinking, and 144 who had intentionally got into water. As part of the campaign, a 30-second film has been created that shows how drinking alcohol can impact on the body’s ability to cope with the shock of being in cold water. A series of images for social media are also being used, which show perilous locations such as dark roads and underpasses, along with the message "Would you let your friend walk home along here? ", next to pictures of deserted waterways with the message "So why let your friend walk alone near water?" Among organisations collaborating to spread the campaign message are police, firefighters and coastguard services in Devon and Cornwall, where live PR activity will take place next Wednesday (6 December), alongside social media. Devon and Cornwall Police are working with Falmouth Coastguard Rescue Team and Falmouth Community Fire Station to promote the campaign, alongside four local pubs. The campaign is of particular significance in the area following the death of local fisherman Josh Winsper, who drowned in nearby Milford Haven last year after a night out drinking. It follows the region’s #coastsafe campaign, which ran last summer, with the aim of reducing drownings and accidents on the Cornish coast. 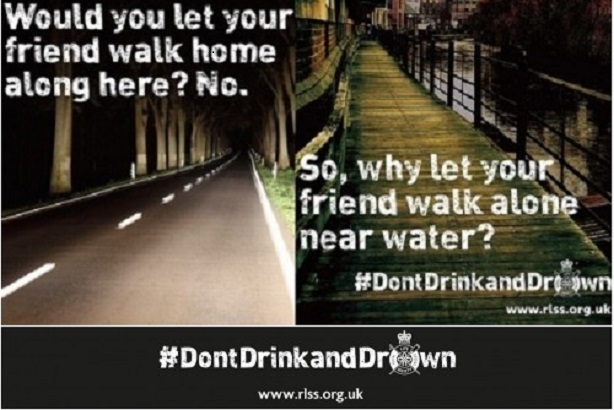 Debbie Pugh-Jones, comms lead for the police force’s Plymouth and Cornwall Basic Command Units, told PRWeek: "We are making the most of all the social media accounts and sites run by blue light personnel across Cornwall by sharing the Don’t Drink and Drown message in support of the campaign." A press release has already been used in print media, while radio and TV coverage is expected during the live event. Other police forces already promoting the campaign include Kent Police, which organised a live event for students, while South Wales Police has been tweeting the messaging. Meanwhile, Tyne and Wear Fire and Rescue Service is planning a social media drive, with daily updates via Twitter and Facebook. Karen Leech, corporate comms manager for the service, said: "The campaign is important to raise public awareness, as there were a lot of callouts last year for missing people, so it's about making people aware of the risks of water ahead of the festive season." Creative social media coverage has been developed by the HM Coastguard team in Ayrshire, Scotland, as it prepares for the launch. And tweets from Lego-based Twitter account @CoastguardTeam aim to bring an eye-catching twist to the message. The public sector backing of the movement was welcomed by Porcha Treanor, comms manager for the Royal Life Saving Society UK. "The value of having fire and rescue services, police forces, ambulance trusts, the coastguard and other public sector organisations sharing our messages is that through their own social media channels they have further access into communities, and those already engaged with them are receptive to such messages," she told PRWeek. "The impact of their support is invaluable. As a charity, we would not have the campaign budget to reach into these communities without this collaboration, despite our messages being powerful and this issue affecting all communities across the UK."